Charles Lee Irons. The Righteousness of God: A Lexical Examination of the Covenant-Faithfulness Interpretation. Tubingen: Mohr Siebeck, 2015. 540 pp. $135.00. The Righteousness of God is the published form of Irons’s 2011 dissertation at Fuller Theological Seminary under Donald Hagner, with Seyoon Kim as second reader and Mark Seifrid as external reader. It’s an exhaustive lexical analysis of righteousness language in the Old and New Testaments that also takes into consideration Second Temple Jewish and contemporaneous extra-biblical Greek usage. More specifically, this monograph focuses on δικαιοσύνη θεοῦ and subjects Cremer’s Hebraic/relational theory to robust lexical scrutiny, strengthening the philological case for a traditional Lutheran understanding of justification by undermining the NPP (New Perspective on Paul) claim that Paul’s δικ-language is sociological rather than soteriological. Irons begins in Chapter 1 by providing a history of interpretation of δικαιοσύνη θεοῦ in Paul that demonstrates that despite variations in some details, Patristic, medieval, and Reformation interpreters all understood it soteriologically. He also provides a detailed sketch of the interpreters and ideas that led to the NPP understanding of δικαιοσύνη θεοῦ as God’s saving activity in keeping with his covenant faithfulness. Then, in Chapter 2, he lays out the methodological assumptions and considerations of the study, dealing with lexical semantics, Septuagint studies, and Jewish literature composed in Greek. As pertaining to lexical semantics, Irons argues that NPP scholars and their predecessors have been guilty of a subtle form of illegitimate totality transfer in which concepts derived from some contexts are read into the lexical sense of the word as well as reading hyponyms as synonyms where “faithfulness” and “righteousness” are in parallel. In regards to Septuagint studies, Irons shows the Achilles’ heel of the Cremer theory to be the fact that not all stereotyped equivalents (a word consistently employed in the target language as the translational equivalent for a word in the source language) are calques (a stereotyped equivalent that has become fixed in the target language). The next four chapters are the heart of the study, as Irons investigates righteousness in different corpora of relevant literature. He sets the baseline in Chapter 3 by examining righteousness in extra-biblical Greek, surveying a representative sample from the first occurrence of δικαιοσύνη in the 6th century BCE to the 2nd century CE. Irons’s contention in this chapter is that “the Hebraic/relational theory of righteousness operates with a false contrast between Greek and Hebrew thought. Even extra-biblical Greek recognizes that keeping one’s promise is a subset of ‘righteousness.’ Coversely, Hebrew usage is just as judicialy stamped by the concept of iustitia distributiva as extra-biblical Greek, if not more so” (84). In Chapter 4 Irons surveys the semantic range of צֶ֫דֶק/צְדָקָה in the Hebrew Bible and δικαιοσύνη in the LXX excluding the apocrypha to test the validity of Cremer’s relational theory with respect to the OT. He then weighs what he sees as the seven primary arguments for Cremer’s relational interpretation: righteousness as “thoroughly positive” (never negative); appeal to Hebrew parallelism to negate the judicial element of righteousness; arguing from the LXX’s use of dικαιοσύνη to render חֶסֶד that righteousness is exclusively positive and that dικαιοσύνη has taken on the covenantal overtones of חֶסֶד; that righteousness involves conformity to a norm; the antithesis between “the righteous” and “the wicked”; Psalm 69:27; and Genesis 38:26. Against Cremer’s argument that the Hebrew usage of “my/his/your righteousness” in reference to God’s judicial activity should be classified as iustitia salutifera rather than the Greek/Latin iustitia distributiva, Irons demonstrates that the righteousness of God in both the Hebrew Bible and the LXX (excluding apocrypha) is precisely iustitia distributiva. Finally, Irons briefly examines a representative sample of OT texts that refer to God’s righteousness and shows that fundamentally, this phrase in the OT “refers to God’s justice in executing judgment on the enemies of his people and thereby vindicating his people in the face of their oppressors” (178). Next, Chapter 5 provides an overview of the righteousness of God in Second Temple literature to see whether the relational theory of righteousness is a semantic possibility for Paul, surveying the DSS, Apocrypha and OT Pseudepigrapha composed in Hebrew, Apocrypha, OT Pseudepigrapha, and other Hellenistic Jewish literature composed in Greek, and NT literature outside of Paul. Irons finds the Qumran writings to demonstrate the highest degree of continuity with OT usage while demonstrating a development and spiritualization of salvific/delivering usage. This spiritualization is not found in Jewish literature composed in Hebrew, Jewish literature composed in Greek, or the NT outside of Paul. Additionally, “righteousness” in the sense of doing something correctly is seen in a very limited fashion in these texts, dealing a decisive blow to the NPP view that δικαιοσύνη has a Hebraic, relational, and covenantal meaning in Paul. Lastly, iustitia salutifera language is found to be quite limited in the Jewish literature composed in Greek and seems to only occur in messianic contexts. The Righteousness of God is a must-read for anyone interested in Pauline soteriology, and especially NPP and specifically δικαιοσύνη θεοῦ. Irons’s exhaustive lexical analysis of all the literature that formed Paul’s context not only strengthens the traditional view of this phrase but is a formidable force that must be dealt with by all future studies arguing for Cremer’s relational view. Regardless of where one stands on the NPP/OPP debate, The Righteousness of God is a significant contribution to Pauline soteriology with which all future conversation must engage. Many thanks to Mohr Siebeck for the review copy! The newest book on the New Perspective on Paul (hereafter NPP) offers a creative way beyond the NPP/TPP (“Traditional Perspective on Paul”) impasse by way of a theory of development in Paul’s soteriology throughout his letters. In the creatively titled Paul’s New Perspective, Garwood Anderson points to both what each side of the debate has right and how each side errs as well as proposes a novel synthesis that provides a plausible explanation of why elements of both perspectives are seen in the Pauline corpus. The thesis of the book is captured by the title: “the new perspective on Paul is Paul’s oldest perspective and the ‘old perspective’ describes what would become (more or less) Paul’s settled ‘new perspective'” (379). In Chapter 1 Anderson begins by noting four gains of the NPP (reconsidering Paul’s conversion, reappraising the “soteriology of Judaism, reframing Torah observance, and renewing the covenant) before showing how each falls short and needs nuance. Chapter 2 examines a representative sample of texts (Phil 3:1-11, Rom 3:21-4:8, and Eph 2:1-22) that illustrate the insufficiency of both the NPP and the TPP. Anderson demonstrates that “texts that both paradigms have claimed for themselves actually need to be shared, and once shared, call into question the exclusive rights of both paradigms” (58). With both Philippians 3:1-11 and Ephesians 2:1-11, he shows how half the passage essentially supports the NPP while the other half essentially supports the TPP. In his discussion on Romans 3:21-4:8 Anderson introduces a point that he will repeat throughout the heart of his book (chapters 6-8) and which is a pillar of his thesis: Romans marks a transition in Paul’s developing soteriology. As will be noted and developed in Chapters 6-8, Anderson argues that Paul’s soteriology in his earlier letters is essentially NPP and later “settles” into basically the TPP view. Romans is the transition point where characteristic elements of both overlap. “To put it oversimplstically, the besetting fault of the NPP is to read Romans too closely to (its reading of) Galatians, and the prevailing fault of the TPP is to read it too closely to, say, (its reading of) Ephesians, when the letter is not quite the same as either but marks a theological transition between the two, sharing and combining elements of both” (84). In Chapter 3 Anderson surveys the NPP and post-NPP landscape. He begins with two primary figures associated with the NPP, James Dunn and N.T. Wright, and shows how their own views have become more nuanced (in the case of the former) and even transcended the NPP (in the case of the latter). Then he examines the views of several prominent post-NPP scholars (Francis Watson, Douglas Campbell, Michael Gorman, Michael Bird, and John Barclay), illustrating the trend toward rapprochement (with the exception of Campbell) and eschewal of false dichotomies. The second part of the chapter examines several common polarizations in Pauline scholarship: whether Paul reasoned prospectively (from plight to solution) or retrospectively (from solution to plight), whether his theology was coherent or contingent, whether justification for Paul is constitutive or incidental, forensic or participatory, and whether πίστις χριστοῦ is subjective or objective. The next two chapters establish the foundations upon with Anderson’s thesis is built. Chapter 4 explains what his developmental hypothesis is and isn’t as well as establishes a working Pauline chronology upon which it is grounded. Centrally, he argues for the South Galatian hypothesis and Galatians as Paul’s earliest extant letter. In Chapter 5 Anderson argues for the plausibility of Pauline authorship of each of the disputed letters. The next three chapters develop Anderson’s thesis and are the heart of this book. Contra norms of Pauline scholarship that analyze the seven undisputed Paulines synchronically, Anderson investigates the whole canonical corpus diachronically according to his proposed chronology. Against the prevailing tendency to read the entire corpus through the lens of a letter or part of a letter, Anderson lets each letter speak for itself. His chronological survey of usage reveals fresh and interesting insights. Chapter 6 traces the development of “works of the law” and “grace. In Galatians Paul speaks only of “works of the law” and never “works”; after Romans he speaks only of “works”; and both are found in Romans, the “transition” letter. Anderson proposes that this pattern reflects a “development in Paul’s conception of the matters at hand, from a soteriology originally grounded in the dilemma of Gentile inclusion to a more formal rejection of human attainment as the antithesis of grace” (228). He detects a similar pattern of development for χάρις. In chapter 7 Anderson traces Paul’s use of salvation language and finds a corroborating development, that of the language of “justification” transitioning to that of “salvation.” This marks a transition from a past-forensic to an eschatological-transformational conception. Anderson also examines the emergence of reconciliation as a metaphor. “Together these linguistic and metaphorical transitions mark a reenvisioning of salvation that transcends, while never forgetting, the inclusion of Gentiles into the covenant, increasingly to stress the reconciliation of all to each other by means of their prior reconciliation to God” (282-283). Finally, in Chapter 9 Anderson offers a series of observations that confirm the largely lexical evidence proffered by the preceding two chapters. The book draws to a close with a chapter of summary and conclusion. Paul’s New Perspective offers a new perspective on Pauline soteriology that is interesting and nuanced. At the very least, readers will come away from this book with greater appreciation for the strengths of the other side (whether NPP or NPP) and a greater awareness of the weaknesses of their own. Anderson’s study provides a fascinating new account of how elements of both the NPP and the TPP hold together and a convincing explanation for why we find characteristics of both patterns of soteriology in the Pauline corpus. The connections he draws by showing how “works of the law,” “grace,” and salvation language develop in parallel ways from Paul’s earliest to latest letters are intriguing. Yet fundamentally/methodologically, much of the broader guild will likely not accept Anderson’s thesis because it’s grounded on a handful of minority positions (e.g. Pauline authorship of all 13 letters, Galatians as Paul’s first letter, etc. ), some of which will be regarded as unacceptable/untenable by critical scholarship. As interesting as Anderson’s thesis is, the degree of its explanatory power depends on highly debatable matters of authorship and chronology. Nevertheless, this is a highly commendable read for all who are interested in Pauline soteriology, but especially those of a more traditional/conservative bent. Those who align strongly with a more traditional, so-called “Lutheran” view will likely find themselves uncomfortable and in disagreement at times, especially those more of a “theology” (in the North American sense) than “biblical studies” bent, as they find their systematizations criticized and challenged. But the challenge is good and necessary. Thanks to IVP Academic for the review copy! Matthew W. Novenson. Christ Among the Messiahs: Christ Language in Paul and Messiah Language in Ancient Judaism. Oxford, UK: Oxford University Press, 2012 (paperback 2015). 256 pp. $35.00. Christ Among the Messiahs is a revision of Novenson’s dissertation at Princeton Theological Seminary under Beverly Gaventa. Originally published in hardcover three years ago as a typical monograph costing a kidney, it was reprinted a few months ago as an affordable paperback and there was great rejoicing in the biblical studies land. Against the majority view among scholars that “Messiah” did not mean anything determinative in ancient Judaism and the somewhat bewildering corollary that when Paul used χριστός he did not mean it in any of the its (nonexistent) conventional senses, Novenson argues that χριστός in Paul means “messiah” and that “Christ language in Paul is actually an invaluable example of messiah language in ancient Judaism” (3). Last month IVP Academic released two new books on Pauline soteriology, and since this is one of my perennial favorite topics, I couldn’t wait to dig into both. I’ve just started them, but I wanted to highlight them now especially for those looking for winter break reading and/or last-minute Christmas gifts. This description is overly simplistic and not entirely true, but these two books are in some ways foils of each other, and I wonder if they were intentionally released in close proximity for this reason. No matter where you stand on Paul, it’s good to periodically read and engage with arguments and insights from the other camp. As such, both of the following books are good reading regardless of your perspective on Paul (pun intended). While contemporary writing on Paul is littered with references to the “Lutheran Paul” or the Paul of the Reformation,” what is equally conspicuous is the absence of detailed engagement with the exegesis and theology of the Reformers. Reformation Readings of Paul pairs together historical theologians and Pauline scholars to examine how certain Reformers treated certain parts of the Pauline corpus: David Fink and John Barclay on Luther/Galatians, Robert Kolb and Mark Seifrid on Melanchthon/Romans, Brian Lugioyo and Wesley Hill on Bucer/Ephesians, Michael Allen and Dane Ortland on Calvin/Corinthians, and Ashley Null and Jonathan Linebaugh on Cranmer and the corpus Paulinum. The first essay in each pair is descriptive and tends to set up the historical context and provide background to the Reformer as an exegete. It also gives a glimpse of how the Reformer exegeted the text – his tools and interlocutors, his structuring of the epistle and its argument, as well as his broad theological conclusions. The second essay is evaluative and builds on the first. The Pauline scholar curates a conversation between the Pauline text(s) and their interpretation, interacting with the reading of the Reformers. Problems and questions are noted and recent challenges to the Reformer’s reading are addressed, both what he got right and what he got wrong. Gerald Bray’s concluding essay paints a picture of the factors that shaped the Reformers, from the Patristic tradition to the Renaissance to the medieval university to the theological crisis of the Reformation. Bray draws many connections between the developed medieval system and Second Temple Judaism, noting that while premodern Christians knew nothing about it, the medieval church came remarkably close to replicating it. “Advocates of the ‘new perspective’ on Paul who criticize Luther for failing to understand the spiritual nature of Second Temple Judaism do not show that they realize this, and so they fail to grasp just how much Luther’s background resembled that of Saul the Pharisee” (272). It’s immediately apparent that this book is from an alternate viewpoint than the first, and this is confirmed just a few pages into the book in the first chapter. Thornhill notes that while he has some critiques of Sanders’s view, he is largely in agreement with Sanders’s covenantal nomism as a correction of the traditional view of how one “got saved” in early Judaism. The lack of attention paid to election in the NPP is part of what prompted Thornhill’s study in The Chosen People, which explores “how Jewish authors spoke of election and how this background knowledge relates to Paul” (16). The Chosen People had its genesis in Dr. Thornhill’s PhD dissertation at Liberty Baptist Theological Seminary under Dr. Leo Percer, with Dr. Gary Yates and Dr. Michael Heiser as readers. With social, historical, and literary sensitivity, Thornhill examines relevant Qumran, apocryphal, and pseudepigraphal texts to elucidate the thought world of late Second Temple Judaism in relation to election. Thornhill finds that election in both late Second Temple literature and Paul was largely a collective reality; in the rare instances in which individuals were in view, soteriological standing was not in view, but rather, their character or representation of the group. Election in both groups of texts was also corporate, conditional, and remnant-oriented. Furthermore, both simultaneously emphasize divine initiative and human responsibility. Probably most controversial will be Thornhill’s re-reading of Romans 8:26-11:36, a pillar text for the traditional Reformed understanding of election. Rather than predestination of the individual believer to salvation, for him Romans 9 is about Gentile inclusion in the people of Israel. Among Jews of the period, the concept of election came to signify the “true Israel” or “remnant,” meaning those Israelites who remained faithful to the covenant. For Paul the terminology takes on quite the same meaning. In referring to those who have trusted in Jesus as “elect” or “chosen” or “called,” Paul claims that it is those who have been united with God’s Messiah who are actually in right standing with God. Torah-faithfulness apart from obedience to the good news of God expressed through Jesus has become useless. For Paul, obedience to God comes only through identification with Jesus. Thus Jesus’ own faithfulness both grounds the faithfulness of the believer and brings God’s declaration of “rightness” to them. For more detail on this book, check out Ben Witherington’s interview with the author (Part 1, 2, 3, 4, 5, 6). My review of Jesus, Paul, and the People of God was just published over at Exegetical Tools. Edited by Richard Hays and Nicholas Perrin, this book brings together the proceedings of the 2010 Wheaton Theology Conference and is a very enjoyable read for anyone with interest in Jesus studies and Pauline studies, obviously with extra drawing power for those who want to critically interact with N. T. Wright’s contributions in these two areas of NT scholarship. As I mention in the review, my favorite essay was probably Vanhoozer’s – “Wrighting the Wrongs of the Reformation? The State of the Union with Christ in St. Paul and Protestant Soteriology.” Since his aim is “to encourage peace talks between New Perspectives and Old Protestants” (236), this is an important essay for those who identify with either camp. As an “Old Protestant,” I find this piece to be illuminating, nuanced, witty, and an important corrective for those with a traditional Reformation understanding of justification who write off Wright completely. Furthermore, because I’m particularly interested in the topic of union with Christ, I appreciated Vanhoozer’s contention that the key to incorporated righteousness reconciling old and new perspectives is both sides giving more attention to union with Christ. What fortuitously has been called the ‘new perspective’ on Calvin’s soteriology anticipates, though not always for the same exegetical reasons, some of what the New Perspective has aimed to discover about Paul’s theology. In particular, what Calvin does with Paul’s notion of union with Christ provides fertile ground for a meeting of old and new perspective minds. Reading Calvin read Paul on union with Christ illustrates what systematic theology at its best can contribute to the discussion: not an imposition of some foreign conceptual scheme onto the text but rather a conceptual elaboration of what is implicit within it. It may also show us that there is more truth and light yet to break forth out of the research program we know as Protestant soteriology (247, emphasis original). Check out the review for an overview of each of the essays. TL;DR: everyone interested in the topic of justification vis-à-vis the Old/New Perspective on Paul debate must read Vanhoozer’s essay; but the entire book is great for all students and scholars of the NT. Many thanks to my friends at IVP Academic for the review copy! Simon Gathercole. 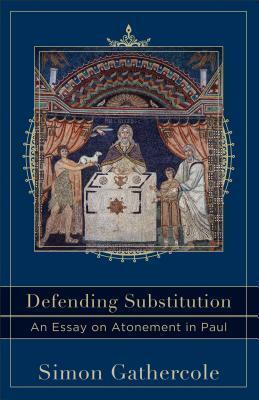 Defending Substitution: An Essay on Atonement in Paul. Grand Rapids, MI: Baker Academic, 2015. 128 pp. $19.99. Defending Substitution is the latest volume in Baker Academic’s Acadia Studies in Bible and Theology series. Sponsored by Acadia Divinity College and in conjunction with its Hayward Lectureship, this series is designed to offer brief, accessible volumes that present the cutting edge of academic biblical and theological scholarship in a form amenable to the nonspecialist. In Defending Substitution, Simon Gathercole offers a brief and accessible overview of the most prominent objections to substititionary atonement and provides a brief but robust positive defense of the the doctrine. Gathercole begins in the introduction by setting forth his modest aim of arguing that “Christ’s death for our sins, in our place, instead of us, is in fact a vital ingredient in the biblical (in the present discussion, Pauline) understanding of the atonement. It should be emphasized, however, that the argument here does nothing to undermine the importance of representation and participation. Rather, the point is that substitution can happily coexist with them” (14). He also briefly defines substitutionary atonement and clarifies what he will and will not address in this short volume. Specifically, the focus is narrowly on substitution as Christ’s death instead of us, in our place and not on related issues such as representation, propitiation, and satisfaction. Gathercole concludes the introduction by briefly addressing some common theological, philosophical, logical, and exegetical objections to substitution. It is exegetical objections that are the focus of this study. In chapter 1 Gathercole addresses three prominent cases against substitution: the Tübingen understanding of representative “place-taking,” interchange in Christ, and apocalyptic deliverance. He notes the strengths of each of these positions but also points out their difficulties and weaknesses. Gathercole points out their common weakness of downplaying the importance of individual sins/transgressions. The next two chapters make a positive case for substitution, with chapter 2 focusing on 1 Corinthians 15:3 and chapter 3 focusing on Romans 5:6-8. Chapter 2 first makes a case for the central importance of Christ’s death “for our sins” in Paul, then examines the influence of Isaiah 53 on 1 Corinthians 15:3, next draws attention to the substitutionary nature of Christ’s death in 1 Corinthians 15:3, and finally looks at 1 Corinthians 15:3 as a test case for whether the Tubingen view of representative “place-taking” works. Next an excursus is devoted to responding to the objection of why Christians still die if atonement is substitutionary. Gathercole notes four elements or “kinds” of deaths (literal deaths of believers, metaphorical deaths of believers, deaths of nonbeliever, death of Christ) that need to be seen in the background in order to see how this objection is not valid. In the final chapter, Gathercole mines the classical literature of antiquity to show that “Paul’s language about Jesus dying ‘for us’ echoes very closely the language used frequently in non-Christian literature to describe substitutionary or vicarious deaths” (85). The upshot is that “Jesus’s death is both similar and different: it is comphrehensible to a gentile as a substitutionary death like other, more familiar cases, but it is also a shocking instance of it” (86). He notes examples of conjugal love (Acelstis), friendship (Phintias and Damon), and family members (Philonides). In comparison of these classical examples with what Paul wrote in Romans 5, the point of commonality is that there is a death of one person for another. The difference is that in the case of Christ the death is for an enemy, not a spouse or friend or family member. Defending Substitution is an excellent introduction to some of the scholarly debate surrounding the atonement and provides a brief and accessible exegetical defense of substitutionary atonement through two Pauline texts. It’s a great book for laity with academic interest in soteriology as well as beginning Bible college or seminary students. Given its intended audience and intentionally limited scope, there’s really nothing to criticize in this book. Thanks to Baker Academic for the review copy! Chee-Chiew Lee. 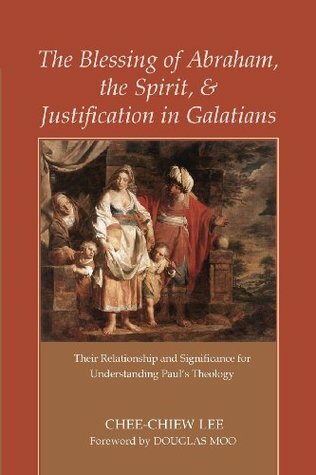 The Blessing of Abraham, the Spirit, & Justification in Galatians: Their Relationship and Significance for Understanding Paul’s Theology. Eugene, OR: Pickwick Publications, 2013. 256 pp. $28.00. This book is a revision of a dissertation done under Douglas Moo at Wheaton. In this study, Chee-Chiew Lee investigates the relationship between the Abrahamic blessing and the promise of the Spirit in Galatians 3:14. Finding the arguments of those who see no relationship between these two motifs unconvincing and the explanations of those who do see a relationship (whether as equal or related in some other way) unsatisfactory, Lee undertakes perhaps the most thorough study of the topic to date by looking at the two motifs throughout the OT and Second Temple literature. She thereby offers a cogent explanation of the relationship between the Abrahamic blessing and the promise of the Spirit, why Paul juxtaposed these two motifs in Gal 3:14, and how their relationship sheds light on Paul’s overall argument in Galatians and the theology of justification therein. This study begins with a contextual and exegetical overview of Gal 3:1-14 in Chapter 2. Lee demonstrates that Gal 3:1-14 is situated in the context of Paul’s discussion of justification by faith and argues that the passage “constitutes the primary substantiation of his fundamental assertion in Gal 2:16 that justification is by faith in Christ Jesus and not by works of the law. The elaborations in Gal 3:15-6:10 may be seen as the secondary substantiation of Paul’s thesis” (22-23). In introducing the key issues related to determining the relationship between the Abrahamic blessing and the promise of the Spirit in Gal 3:14, Lee first looks at the other occurrences of juxtaposed ἵνα clauses in the Pauline letters before coming back to discuss Gal 4:4-5 and applying the findings to Gal 3:14. Outside of Galatians, when Paul juxtaposes of ἵνα clauses there is a general pattern of the second clause explicating the first and of the content of the two being related but not equal. Lee notes that there are exceptions; that while these two observations are important, syntax alone is not decisive in determining the relationship between the Abrahamic blessing and the promise of the Spirit in Galatians 3:14, and that the context of Galatians is key. Lee notes that “the Spirit should not be equated with the Abrahamic promise or taken as the fulfillment of the Abrahamic blessing. Rather, the promised Spirit is likely to be understood in the prophetic tradition of Isaiah, Jeremiah, and Ezekiel in relation to the Abrahamic, Sinai, and new covenants” (60). Timothy Keller. Romans 8-16 For You. The Good Book Company, 2015. 224 pp. $22.99. The God’s Word For You series from The Good Book Company is one of the best biblical resources for the Church. Whether used by students and scholars for devotional reading, consulted by ministry leaders for preaching and teaching, or used as an expository guide into deeper Bible study for the person in the pew, this series consistently combines solid exposition with helpful quotes and illustrates in a way that deepens one’s knowledge of the biblical text, stirs one’s heart with biblical truths, and facilitates gospel-centered application and life-change. For the typical church-goer, the volumes in this series are excellent and must-have guides to the respective biblical books. While all Scripture is breathed out by God and profitable for teaching, for reproof, for correction, and for training in righteousness, it’s hard to deny that in a sense there is something extra-special about the Epistle to the Romans. It is, as Luther wrote in his commentary on the book, the “purest gospel.” No other section of the Bible takes us to such devastating lows in confronting us with our depravity, and no other section of the Bible takes us to such soaring heights with the reality of our justification and union with Christ. And through the Spirit of God this marvelous book has been the explosive catalyst in the lives of giants in the faith like Augustine and Luther, whose effects are still felt in the Church today. I must confess that I’m much more familiar with the first half of Romans than the second (save for, perhaps, chapters 9-11). This is probably due to my Reformational understanding of the gospel – for in the first half of the letter is where we find the heart of the doctrine of justification by faith. The second half of Romans is more practical, focusing on how the gospel changes us in real life. Romans 8-16 is classic Tim Keller – sound, gospel-centered exposition of Scripture that’s at the same time winsome and relevant, with both rich theological quotes (e.g. Owen, Lloyd-Jones, etc.) as well as helpful illustrations and real-life stories. Because the second half of Romans contains some texts that are controversial in the evangelical world (e.g. Romans 9-11 and the topics of election as well as Israel and the Church, Romans 13 and the topic of how Christians relate to the state), in these chapters of Romans 8-16 for You readers may find themselves disagreeing with Keller’s perspective. These topics are outside the scope of an expository guide to cover in depth; but thankfully, Keller does address election and the sovereignty of God in an appendix. 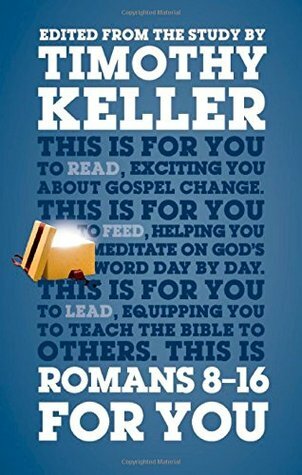 I highly recommend both Keller’s two-volume set on Romans from the God’s Word for You series. It’s especially valuable for laypeople as a guide to studying the book of Romans, but is also a helpful aid (alongside technical commentaries) for those preparing to teach or preach from Romans. I’m not sure how long this price will last, but on the publisher’s website the two-volume set is a bit cheaper than buying them individually. I received a free copy from the publisher via Cross Focused Reviews in exchange for an honest review. Matthew S. Harmon and Jay E. Smith, ed. 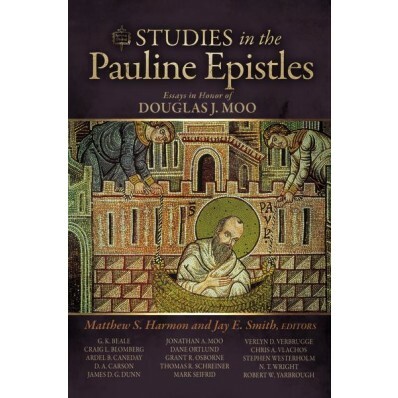 Studies in the Pauline Epistles: Essays in Honor of Douglas J. Moo. Grand Rapids, MI: Zondervan, 2014. 320 pp. $49.99. This is the final installment of a three-part overview of the Festschrift presented to Dr. Douglas Moo at last year’s ETS Annual Meeting (read part 1 and part 2 if you missed them). Robert Yarbrough kicks off this last section with an essay entitled “Salvation History” (Heilsgeschichte) and Paul: Comments on a Disputed by Essential Category” in which he offers nine propositions for why we need to read Paul with a salvation-historical hermeneutic. Next is G. K. Beale with “The Eschatology of Paul.” Beale first provides as background a brief survey of “latter days” and similar phrases in the OT and Second Temple Judaism, and then goes on to give an overview of Paul’s eschatology, demonstrating it to be an inaugurated eschatology linked with new creation. Finally, Beale shows how the resurrection of Christ, the Holy Spirit in relation to resurrection and regeneration, the Holy Spirit in relation to sanctification, justification, the law, and ecclesiology are all best understood through the lens of already and not yet eschatological new creation. His [Paul’s] interest in citing Jesus’s ethical teachings far more than his theological sayings, combined with broader conceptual comparisons of the theologies of Jesus and Paul (showing that Paul almost certainly knew Jesus’ views on a much broader array of topics than he explicitly discloses), suggests that there was more divergence in his churches from orthopraxy than from orthodoxy. This is a significant conclusion in a n age when comparatively minor differences in the theologies of various New Testament books are often exaggerated and turned into major, conflicting strands of early Christian thought. Where there was divergence, it appears to have been more in the areas of peripheral elements of eschatology than in core areas like Christology.